Want to buy a Swiss Army Pocket Knife? Do you know about all the different types of Swiss army pocket knives available? Our guide gives you the facts & information you want to know. If a knife is a tool for cutting objects, what does a pocket knife do? Cut pockets only? A lot of people would say no and will begin telling you a very long list of what a pocket knife can do. A pocket knife is a term used to describe a small knife that can be bent to fit inside the handle so that it can easily fit in one’s pocket. Thus, the term, pocket knife. The Swiss Army pocket knife was built to serve many purposes. Aside from its primary blade it typically has several additional features like a screw driver, a letter opener, a can opener and these features can vary from product to product. To keep all of these attachments intact, a pivot point mechanism was adopted and it is cleverly covered by the handle. Swiss Army pocket knives are usually red with a cross and a shield as the logo imprinted on the side of the handle. This reminds users about Switzerland because the Swiss Army pocket knife originated from Ibach Shwyz, Switzerland. 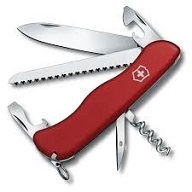 Wenger and Victorinox owned “Swiss Army” as a trademark for the products that they manufactured. These companies were suppliers of knives to the Swiss Armed Forces. While “Swiss Army” was the trade mark of Wenger and Victorinox, the US army added the work knife into the combination which resulted in forming the now world famous Swiss Army knife. Nowadays, when people refer to Swiss Army knives what pops into one’s mind is dependability, quality, multipurpose and usefulness. The Swiss Army pocket knife is an incredible tool! What was the story behind this amazing thing? The Swiss Army Pocket knife has come a very long way. Back in 1891, Karl Elsener, wanted to make knives made in Switzerland that would sell because pocket knives were made by Germany. To make pocket knives from Switzerland better than the German ones, Karl Elsener devised a mechanism which allows the handle to contain additional features such as the second cutting blade and corkscrew. To set his pocket knives apart from the rest, he placed a cross and shield on them. Thus, the first multipurpose pocket knife was born. Over the years, several changes and additions were made to the Swiss Army Pocket Knife. These days, when buyers want to get a Swiss Army pocket knife, they can choose between several different models according to which one best suits their lifestyle and needs.